Malone’s sector of Belle City included Rose Hill Park, a large green area nestled between middle class apartment complexes that had no hills or roses. The closest thing to roses were the droopy yellow buds in a sixth-floor window box. The park did have a massive, thick-trunked tree that grew in the center of the green. Its branches reached out in every direction; thousands of vibrant green leaves swayed in the humid breeze. Malone reclined within the shaded branches, along a fork in the sturdy trunk, well out of anyone’s sight. The only way to find her would be to climb the tall trunk, a feat itself since the first branch was taller than most grown men. Children played on the green, kicking a dirty ball back and forth. Their flushed faces showed their exhaustion, but their laughter ricocheted up through the leaves. She’d made the preliminary lap around her sector; all was well. If something happened, an alert would ring through the communicators. She wasn’t worried. Two months in, she’d only been called to one scene. It had been a poorly thought-out robbery in which the desperate thief, in hopes to prolong his judgement, claimed to be a devil. Protocol dictated that in such cases an agent was needed, and so she, instead of an officer, punched the sop and cuffed him. Being an agent wasn’t as much of a job as it was a sentence. Upon her arrest, Clearwater had offered her two options: face a trial or join the PAB and help track down Sylvester. She’d signed her life away. Although she could roam the city, her sector during the shift and anywhere else off-shift, she felt them watching her. Officers disguised as civilians followed her wherever she went, day and night. They didn’t trust her. However, if she were them she wouldn’t trust her either. Most likely, Clearwater received a daily report on her whereabouts and activities. Edgar Vincent, head of the PAB, would as well. It didn’t matter; she didn’t go anywhere illegal anymore. She could run, but they would hunt her down again. Next time she wouldn’t get a choice. It would be a death sentence, shoot on sight. A steady wind rustled the leaves. The sun poked through and freckled hot dots on her skin. Even with sunglasses, the brightness stung. She closed her eyes against the intrusion and lifted her arm up to block the worst of the sun. “Hey, Malone,” Snakeskin’s voice came through the static. She pulled the communicator from her belt. The shifting sunlight dazzled on the red metal surface and sparkled in the tiny imperfections. It buzzed a second time, reverberating through her palm. She pressed the little black button on the side with her thumb, and spoke lowly into the speaker as to not attract the attention of those below. He made a sound on the other side, somewhere between a scoff and a laugh. She could picture the face he made: a smirk, one corner of his lips higher than the other, a shrug of his thin shoulders that waved through his entire body, a shift of his eyes to the floor, brow not quite scrunched but not soft. It was the same face he made when given an answer he hadn’t fully anticipated, derailing his thoughts. Malone knew that tone, too. Snakeskin didn’t mean the case. Two months ago, he had kissed her and she had kissed him back. It happened after she’d tried to flee in the middle of the night. Snakeskin had convinced her to stay and give this job a chance, to start over. He’d spent the two months since looking for excuses to spend time together. She’d spent two months avoiding alone time with him. She enjoyed his company, but those alone moments often lead into the beginnings of awkward moments where she knew he wanted to say something that bent toward the emotional side of their relationship, but didn’t know how. Before he could figure it out, Malone found an excuse to leave. His inability to talk about emotions didn’t bother her. She didn’t want to talk about those nasty little things either. Malone shifted on the branch. The bark felt more uneven that it had a moment before. He laughed the full chested laugh she’d gotten used to. It spread a warmth through her own chest that made her want to laugh, too. Behind his laughter, she could have sworn she heard someone else laugh. The second voice was several tones deeper than Snakeskin’s. Her hand tense around the communicator. The devices were not private. Clearwater had told them so. The communications between any agents, officer, or intern could be heard by anyone with a PAB communicator and an understanding of how to change frequencies. The only difference was the color of the metal. Agents had red. Officers had blue. Medical was green. Others were gray. Any conversation had could be heard by any; Snakeskin knew this and kept his suggestions relative to the job. He had good sense, thank goodness. He hadn’t given any implication that there was anything between then other than a professional relationship and friendship. Malone reattached the communicator to her belt and climbed upward through the branches. The higher branches reached over the apartment rooftops and made an easy access point. When her branch hovered over the roof, she dropped down. She glanced down into the park. No one had noticed. Back in the unrelenting sunlight, the oppressive heat returned in full. Malone crisscrossed her sector one rooftop at a time. By the time she jumped across Acorn Avenue into Snakeskin’s sector, sweat dripped from her chin and ran down her scalp. She wiped it away on her shirt hem. She didn’t need to ask where Snakeskin was. The lack of a busy city background to his voice had told her his location: the Belle Tower. In its time, the Belle Tower stood as the tallest structure in the city. It still towered over the buildings in the oldest part of town, but in recent years, downtown’s steadily rising buildings had grown taller. Several streets into the sector, the Belle Tower’s noontime chime filled the city air, its deep gong unaffected by the heat. Malone paused to catch her breath as the bell sounded, once, twice, thrice. Down on the street, the lunch crowd clogged roadways and sidewalks. Fans shook in windows, cranked as high as their little motors allowed, moving the warm air about. People lingered in doorways, dressed as thinly as they could, trying not to melt. Warm, simmering food smells wafted up from a corner restaurant. Malone wanted nothing to do with food. The heat left her exhausted and nauseous and the smell of warm food toyed with her stomach. Something cold sounded much better. Ice cold. Plenty of places advertised such drinks for the summer. She’d have no problem finding something refreshing. Malone continued toward the tower at a slower pace. The Belle Tower came into view; its tall stone structure stood out against the sprawling metal city. It looked out of place, from a bygone era, unchanged by the shifting civilization thriving around it. A tall stone wall surrounded the entire vicinity and tucked away the adjoined temple’s flowery courtyard. She paused at the street crossing. Cars honked past each other down below in the midday race, a madhouse of squealing tires and humming metal hulls. Malone took a deep breath and sent her blood burning. It coursed through her veins and spread the ethereal lightness that she loved so much. She felt light as a feather, as if her human insides had been turned into air. She ran toward the rooftop’s edge. She jumped. Her feet hit the temple’s slanted slate roof. The shingles rattled but held. She glanced down to see if anyone from the street had noticed. No one had. She let her blood fade. It was too hot outside to keep it burning longer than she needed it. She slowly inched her way across the temple’s roof to the tower. The tower belonged to the order of monks who lived in the temple. The only way to climb the tower’s stairs would be to break into the temple. She’d rather not tempt fate any more than she already had. Instead, the tower’s intricate stonework provided easy handholds. In broad daylight, people might have seen her, but she didn’t care to look. Sweaty hair flopped into her face and she roughly whisked it away. She’d have to redo her up-do when she reached the top. Halfway up the tower, she heard music. It grew louder with each handhold. Snakeskin sat on the landing’s stone ledge. One skinny leg dangled over the side and the other propped up beside him at a sharp angle, knee pointing toward the sky. He held his silver harmonica to his lips and fluted an easy melody into the air. The case file sat on the inside of the ledge behind him, protected from the breeze. Snakeskin looked over his shoulder at her, harmonica still at his lips, and those green eyes of his set loose a zoo of insects inside her stomach. They buzzed and flapped all around, agitating the heat-made unease. “Trouble with the case?” Malone asked. She crossed her arms. Sweat squished on the inside of her elbows and she uncrossed them. “Did you look at it at all?” Malone asked. She grabbed the case file and sat with her back to him, against the ledge. She set the case file on her knees and opened it. She didn’t want to bother with the case, but she didn’t want to talk about emotions more. The initial report summed up the case. Over the past two months, an amount of time that sent a shiver down Malone’s spine, over two hundred people had been reported missing. More than triple the usual amount. They vanished in numbers. They vanished at night. No signs of struggle. No notes. No bodies. No nothing. It was as if these people had simply vanished. Families were left behind, jobs abandoned, appointments forgotten, bills unpaid. “So, they’re just gone?” Malone asked herself. “It seems that way,” Snakeskin answered. Malone flipped through the report. A list had been provided with names, basic information, and last known locations, all arranged by date of vanishing. The most recent vanishing acts were listed first: Jack Rowan and Robert Springfield. They’d been working at the Simons Warehouse in the industrial district. Snakeskin shifted his weight on the ledge to sit closer to her. Snakeskin shrugged. He shifted so that both of his feet were on the landing. His elbows rested on his knees. Each breath resounded in her ear and tickled the sweat on her neck. His proximity startled the bugs in her stomach into a frenzy. Hyperaware of every movement he made, a twitch in his fingers, adjustment of his legs, Malone turned another page. She scanned faces, names, and basic information, anything to get her mind off Snakeskin. She turned another page, and then another, reading the information to herself. “Find anything?” Snakeskin asked after a moment. “I don’t know, but it’s not a coincidence. Each vanishing happens in one area per date. See?” Malone held the folder up for him to see the consecutive dates. The strangeness in the case warranted investigation. Malone turned to tell Snakeskin so, but as she moved, he moved to get a better look at the case file. Her breath bounced off his cheek. The nefarious insects that had infested her chest beat against her heart like thunder. 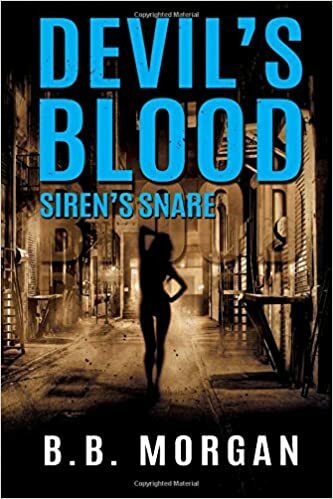 “What do you think you’ll find that the officers missed?” Snakeskin stuffed his hands into his pocket, an act that made her palms sweat just by looking. “Don’t be skeptical,” she said. She started to say something else, but Snakeskin pressed a finger to her lips. “Shush,” he said, finger to his own. His stare focused on something over her shoulder, brows turned inward, lips parted. Malone followed his gaze to the wooden door underneath the belfry. Gentle creaks echoed upward. Someone climbed up the tower from the inside. Malone looked back at Snakeskin. He stepped backward onto the ledge and motioned her after him. He stood with the toe of his shoe hanging off, looking down, and Malone felt her heart fall into her stomach. It was a long way down. She grabbed the case file and tucked it under her arm. She jumped onto the ledge beside him. The street looked a world away, a world dotted with tiny little things that wormed like lice. Her breath hitched. The creaks came closer; Snakeskin and Malone threw themselves off the ledge as the wooden door swung open, and they grasped onto the tower’s stonework to keep from falling. The wooden door slammed and the creaks headed in the opposite direction, louder than before. Malone glared sideways at Snakeskin, who wore his humor proudly. Her fingers began to ache. She brought the folder to her mouth and bit down on the worn paper. Using both hands, she navigated her way back down the Belle Tower. One thought poked its way to the front of her mind. Why were no women missing?